This site is currently in beta and a work in progress. The information requested on the registration form and required at the meeting is being collected and used pursuant to the FACA for the limited purpose of ensuring accurate records of all persons present at the meeting, which records will be made publicly available. Providing information for registration purposes is voluntary; however, failure to provide the required information for registration purposes will prevent you from attending the meeting. 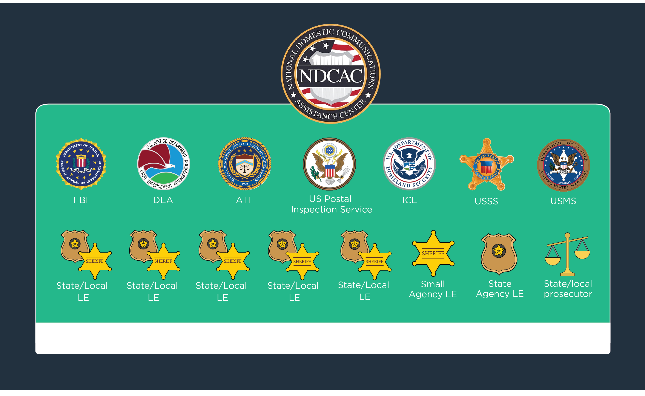 NDCAC has an Executive Advisory Board (EAB) approved by the Attorney General and established pursuant to provisions of the Federal Advisory Committee Act (FACA). The Board will provide advice and recommendations that will promote public safety and national security by advancing the NDCAC's core functions. The Board will consist of 15 voting members from federal, state, local and tribal Law Enforcement agencies with state, local and/or tribal representatives having a majority of one seat. The last Executive Advisory Board (EAB) met on April 11th 2018 in Alexandria, VA. and minutes for this meeting are posted on this site on the Previous EAB Meetings link.